This week we have two special recipes that are guaranteed to get you out of the dog house from my good friend Amy Kritzer, food writer, recipe developer, and the Founder of What Jew Wanna Eat !! What Jew Wanna eat is all about spreading the goodness of home cooked kosher goodness. When she isn’t working on her delicious weekly recipes, Amy also loves theme parties and cowboys. Check out What Jew Wanna Eat today at http://whatjewwannaeat.com/!! Everyone screws up now and again, but one of the best ways get win your partner over after a tiff is cooking a tasty treat. But what to make? Here’s a hint: chocolate and lots of it. 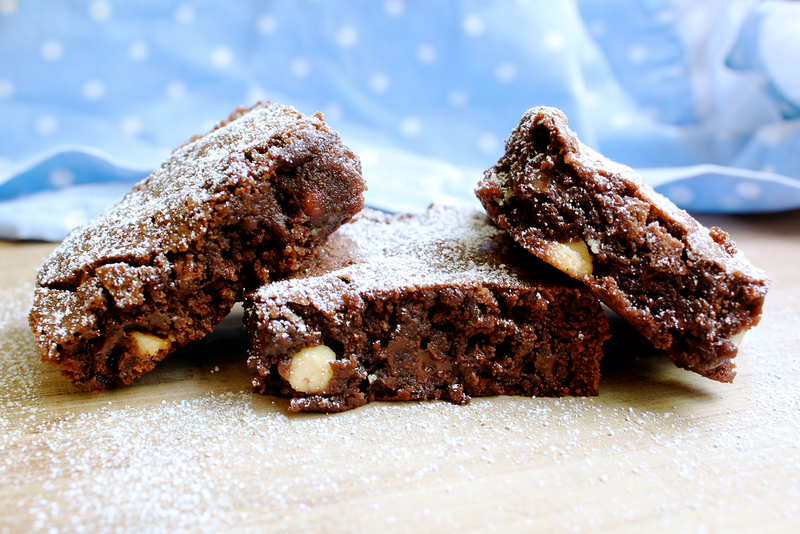 These gooey brownies are so rich, she’ll be in a sugar daze in one bite and forget why she was even mad in the first place. It’s a win/win! Weighing the ingredients yields the best results, but in a rush you can mix the batter together quickly in one pot and have warm brownies before you know it! So you can spend more time making up than cleaning up. Grease 13x9x2 inch baking pan with butter. Bake 25-30 minutes. Brownies will be done when a toothpick comes out almost clean. Let brownies cool at least one hour, or dive in right away! For frosting, beat butter until fluffy, add confectioners’ sugar, and incorporate enough milk to get the desired texture. Frost if desired and garnish with extra chocolate chips or garnish with powdered sugar. Cut into 24 bars in serve! Is there anything more romantic than breakfast in bed? I think not! If you went to bed angry at each other, wake up to these healthy crepes. Slightly sweet with a fresh, seasonal berry sauce, it’s hard to stay mad when you are busy shoveling the best breakfast ever in your mouth. Serve a few of these with a side of bacon, and you may never fight again. Unsalted butter for cooking and powdered sugar for garnish. First, make the crepe batter. Combine the flour, sugar and salt. Then add the eggs, milk and butter and whisk until no lumps remain. Let your batter rest in the refrigerator at least 1 hour to let the gluten relax. The batter can be made the night before. While the batter is chilling, make the filling by whisking together the cream cheese, ricotta, Greek yogurt, powdered sugar and lemon zest. Set that aside and make the berry compote. Combine the butter, blueberries, raspberries, sugar, cornstarch, and lemon juice in a medium pan or pot over medium-high heat. Stir constantly while breaking up the berries a little but still keeping in chunky. Bring up to a low boil and stir gently for about five minutes. The compote will thicken more as it cools. Now time to assemble! To make crepes, butter a 9-inch nonstick pan with a thin coat of butter over medium high heat. Then pour ¼ cup of batter into the pan to coat the bottom. Swirl the pan to coat evenly. After about a minute you will see the ends begin to curl up- your crepe is done! Do not flip. Slide crepes onto parchment paper to allow them to cool. Don’t layer the crepes together or they will stick! Spread a spoonful of the cheese mixture towards the bottom of each crepe. Fold the bottom of the crepe up to cover the filling and then fold the sides in. Then roll like a little burrito! Add 1-tablespoon butter back to the medium nonstick pan over medium high heat and cook on each side until golden brown- or about 1-2 minutes per side. 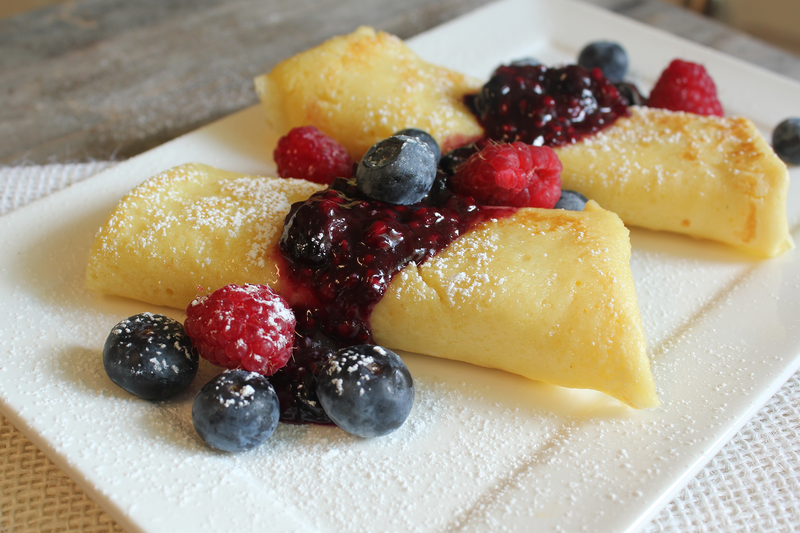 Drizzle berry compote over crepes, and sprinkle with fresh fruit and powdered sugar for garnish. Amy Kritzer is a food writer and recipe developer in Austin, TX who enjoys cooking, theme parties and cowboys. She cooks up modern Jewish recipes such as Tex Mex Potato Latkes and Nutella Rugelach on her blog What Jew Wanna Eat. You can follow her on Twitter, Pinterest and Facebook and Instagram. 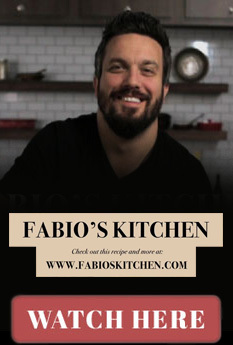 Thanks for letting me share my recipes with your readers Fabio! Cheers!